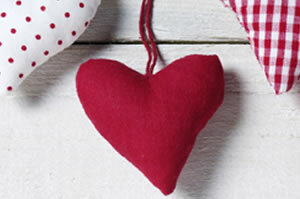 Why not offer your loved one these scented lavender fabric hearts this Valentine’s Day? Notonthehighstreet.com has a wide range of gifts for you to find the perfect present for your loved one! From personalised heart badges to heart pillows and matching heart doorstops. Their range of heart doorstops are available either as cubes or round bottomed, striped or spotty in various colours to suit anyone. If you are looking for the perfect gift that you can’t find anywhere – let us know and we will do our best to find it for you!! !